Valentine’s Day is just around the corner! Still need to make plans? Here are some ways to celebrate Valentine’s Day at Disney Springs. If you’re looking for a romantic dinner with your loved one, you might want to consider these dining options at Disney Springs! 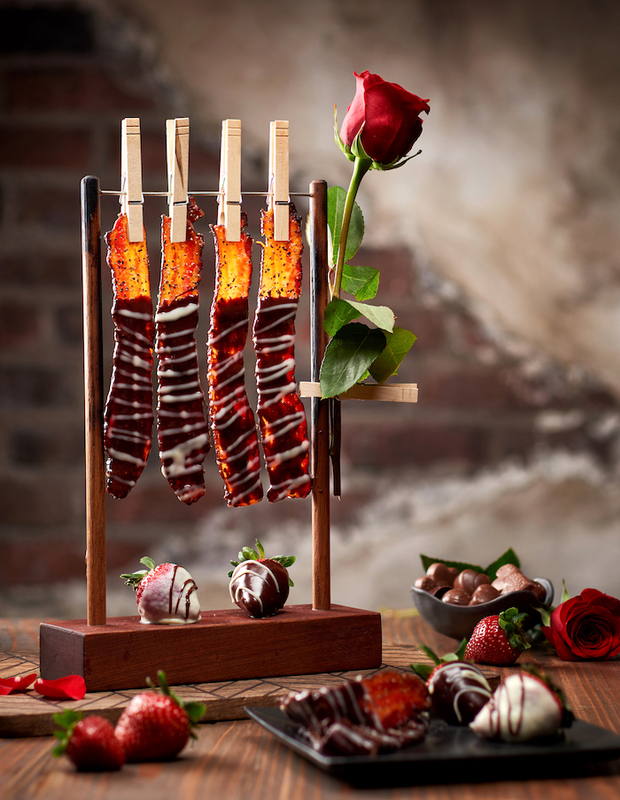 “DB Clothesline Bacon” dipped in smooth milk chocolate from The Edison at Disney Springs. Photo courtesy of Patina Restaurant Group. Enjoy unique, world-class entertainment while you dine at The Edison on Valentine’s Day. Start your meal off with The Edison’s signature appetizer, the “DB Clothesline Bacon,” which is dipped in smooth milk chocolate. 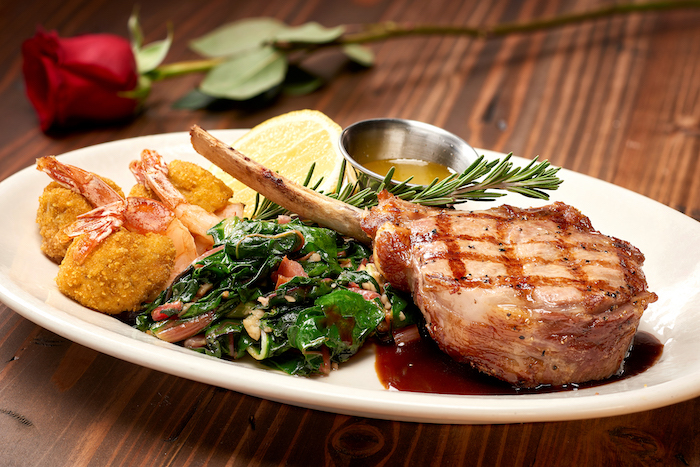 The special holiday entrée is a Grilled Veal Chop with a red wine demi-glace, served with crab-stuffed shrimp and sautéed rainbow chard. 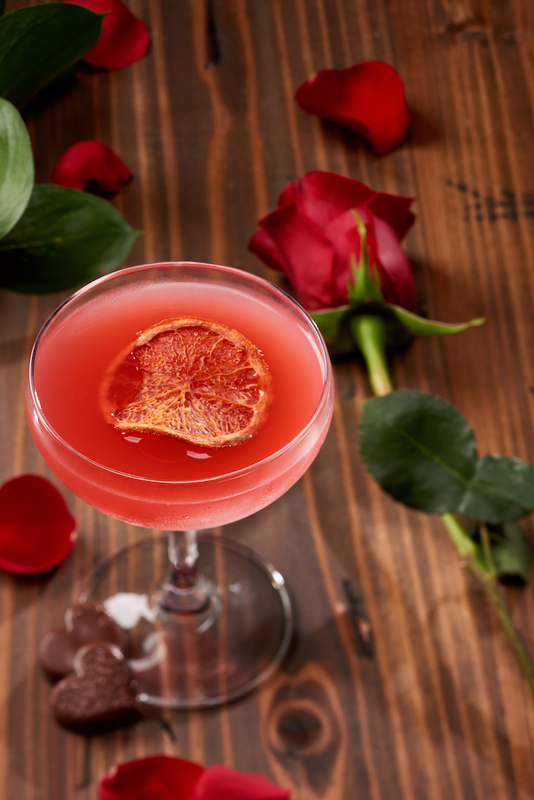 Cap off your night with a “My Pink Valentine” cocktail, which is a sweet and bitter mix of Woodford Reserve, Frangelico, Orange Juice, Earth Rose Pinot Noir, and chocolate bitters. To make reservations, click here or call 407-560-9288. “My Pink Valentine” cocktail from The Edison at Disney Springs. Photo courtesy of Patina Restaurant Group. Visit Maria & Enzo’s to try out their “Love at First Bite” Valentine’s Day menu. 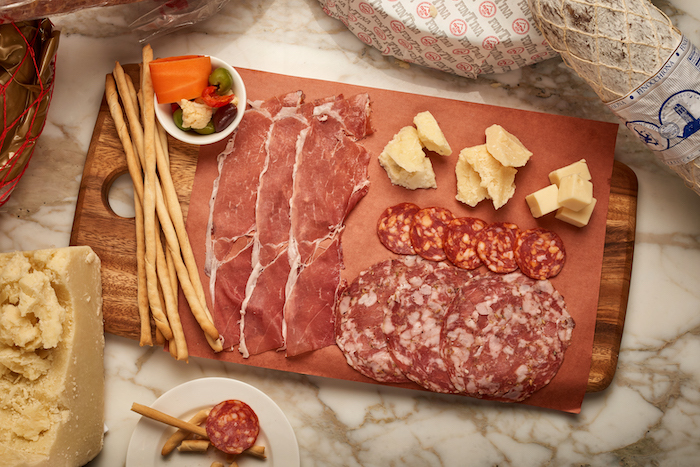 Start off your meal with a shareable appetizer, like the Salumi E Formaggi or Chilled Duo of Oysters. Take the meal one step further with a shareable entrée, like the Duo of Lobster and NY Strip or Traditional Roasted Vegetable Lasagna. End your meal with the Bittersweet Chocolate Ganache Tart, which features salted caramel, bourbon raspberry jam, and ricotta gelato. To make reservations, click here or call 407-560-8466. Salumi E Formaggi from Mario & Enzo’s and Enzo’s Hideaway at Disney Springs. Photo courtesy of Patina Restaurant Group. If you’re looking for a more quiet and intimate evening, visit Enzo’s Hideaway. 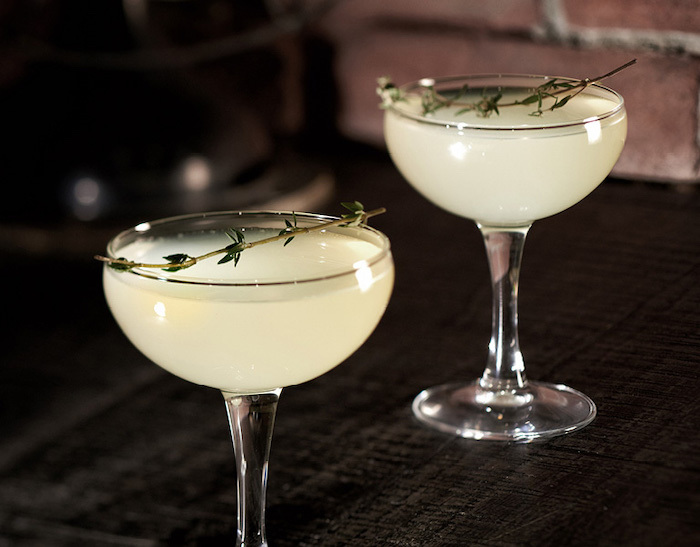 The Valentine’s Day menu is the same as Maria & Enzo’s, but you’ll be quietly tucked away in an intimate speakeasy atmosphere. Perfect for a quiet evening out! To make reservations, click here or call 407-560-3696. Cocktails from Enzo’s Hideaway at Disney Springs. Photo courtesy of Patina Restaurant Group. Another notable date night dining spot is Morimoto Asia. Although there isn’t a special Valentine’s Day menu, it’s still a great place for a couple’s night out! This restaurant has it all – delicious Asian cuisine, a 14-seat sushi bar, a cocktail lounge, and even a late-night take-out window. To make reservations, click here or call 407-939-6686. Yuzu Pie from Morimoto Asia at Disney Springs. Photo courtesy of Patina Restaurant Group. No matter how you want to celebrate, there are plenty of options to choose from at Disney Springs. Whether you want to sit down for a romantic meal, chat over drinks at the bar, or grab a quick bite while window shopping – Disney Springs has you covered! 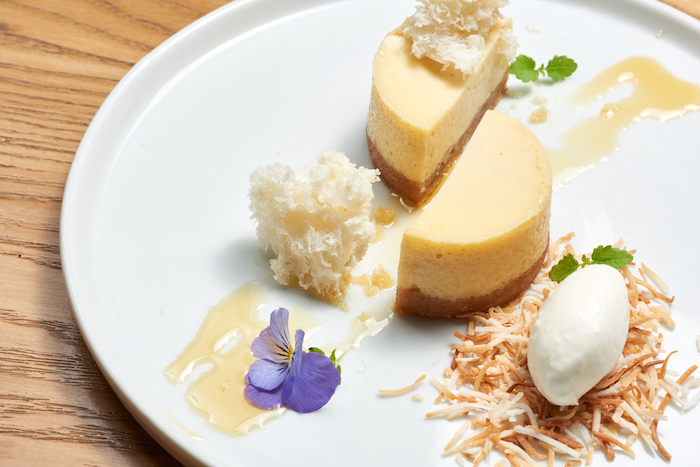 Valentine’s Day is one of the busiest restaurant days of the year, so be sure to book your reservation as soon as possible to secure a table. 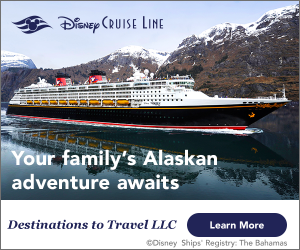 Planning a date night at WDW? Subscribe today!